A luge athlete from the Republic of Georgia, Nodar Kumaritashvili, was killed in a crash in training on the Olympic track at the Whistler Sliding Center on Friday, an official at the track confirmed. 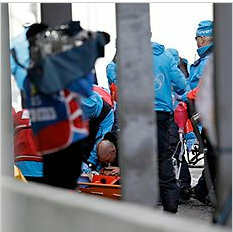 Kumaritashvili lost control of his sled near the end of his run, when he was moving at 88 miles an hour, and was propelled over the track wall into a steel pole. Training was immediately suspended on the track, which many competitors have said may be too fast and too dangerous. Nodar Kumaritashvili rest in peace. Dranstwo,partacze -nie lekarze, nieudolna reanimacja , jeszcze szkodza zamiast ratowac-kretynskie Vancouver, ohydna Kanada! Ale jaki moze byc poziom lekarzy w kraju gdzie studenci wykonyja aborcje, tfu!